Last week, AT&T introduced a new pricing plan that offers an incentive to customers who keep their older phones, allowing them to save $15 a month on their service bill. To be clear, we need to remember that phone subsidies are actually imaginary and that we ultimately pay for our phones in our monthly bills. Subsidies have also held back U.S. customers’ freedom of choice. Europe’s initial refusal to subsidize phones – now most carriers worldwide subsidize – led to a number of service improvements including pre-paid SIM cards, cheaper, simpler handsets, and a number of roaming benefits. There was no reason to lock a phone to a carrier if that phone is crossing borders every few days. 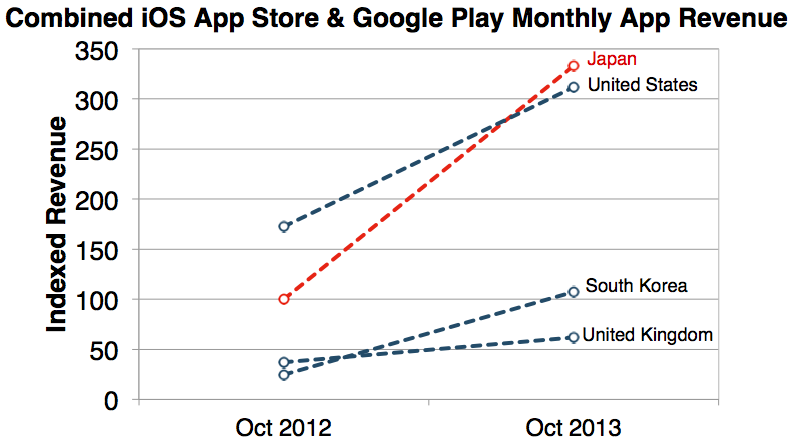 However, the U.S. market is monolithic. We rarely roamed and we rarely looked for pre-paid deals. Essentially Stephenson is saying that back when AT&T was still trying to get customers, subsidies worked. Now that it has all the customers it could want, subsidies are unfair. What’s really happening? Carriers got into bed with the manufacturers and now they want out. We pay the price. You might think people use their smartphones and tablets most when they’re out of the house: in the morning on their commute, or during the day at work. Probably not in the evening, when they’re at home with their TVs and computers. This is exactly wrong. 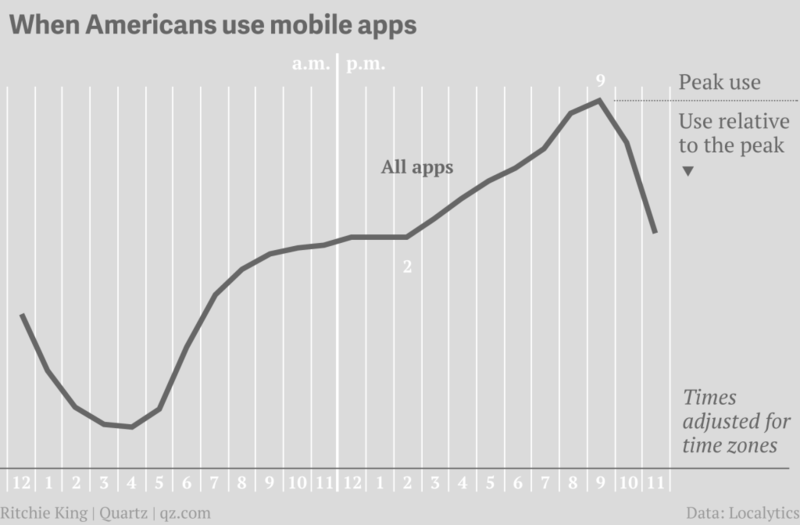 The chart above, first reported by PandoDaily and built from data collected by Localytics, an analytics company that focuses on app usage, shows that, in the US, people use their mobile devices the most at 9 p.m.
What does this mean for app developers and content creators? Depends on what you make. 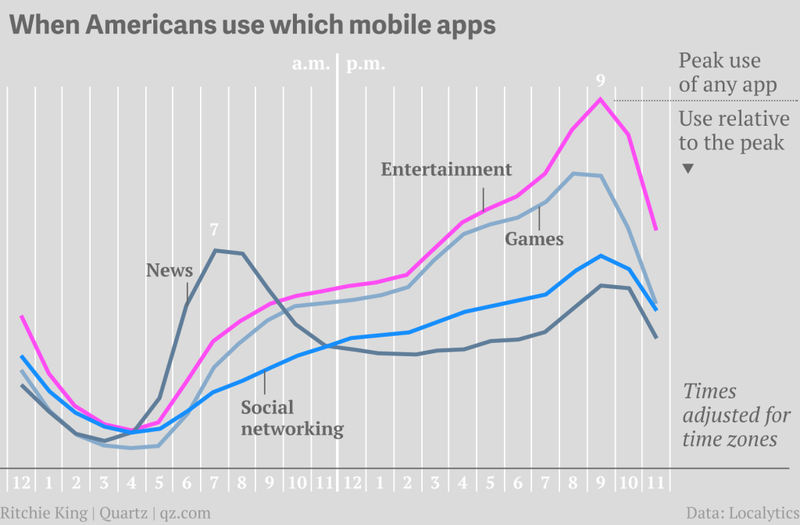 Videos, games, and social media apps are popular to use in the evenings, while news apps see their biggest spike around 7 a.m. The general pattern of evening peaks also holds in other countries, though the profile throughout the day looks slightly different. It’s obvious, right? I’m hardly the first person to point this out. And yet, I still meet so many startups who are focusing on the desktop/laptop-based web first. I get that development and iteration are easier there, but it’s a mistake. Discovery is increasingly an issue, and monetization models are still being fully fleshed out. But, from a pure product perspective, those things don’t matter. 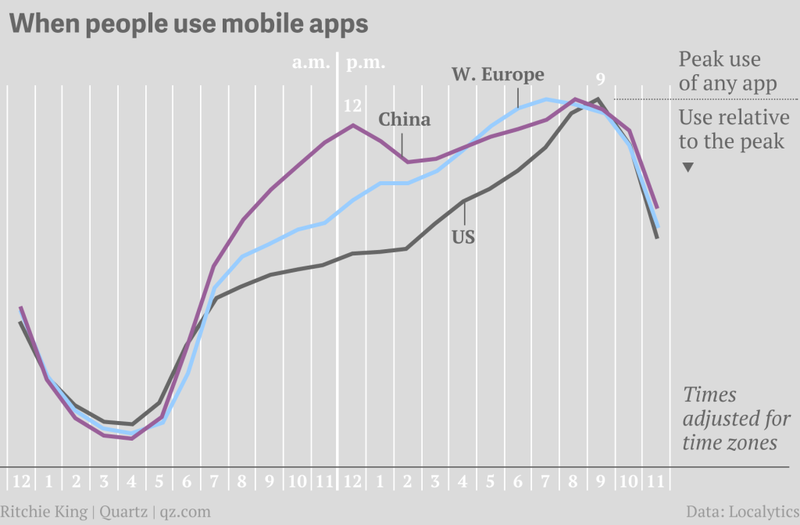 What matters is that in the next five years every person on this planet is going to be using a mobile device. And these devices are going to be used far more than any traditional computer ever has been and ever will be. The PC is over. It will linger, but increasingly as a relic. I now dread using my computer. I want to use a tablet most of the time. And increasingly, I can. I want to use a smartphone all the rest of the time. And I do. The value in the desktop web is increasingly an illusion. 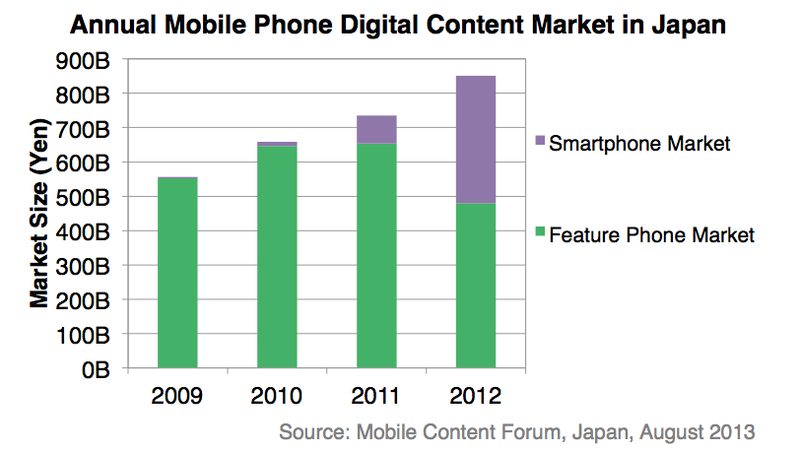 Given the rate at which these mobile devices are improving, a plunge is rapidly approaching. A couple of readers have written to point out that you can still use Google Maps on your iPhone running iOS 6. Just go to http://maps.google.com in Safari and add it to your home screen. That will give you directions, transit and many other features. It’s not perfect, but for those having issues with Maps, it’s something.